The first week of the new year brought a slew of bleak reports for the U.K. economy, highlighting the scale of the challenges to come as Britain prepares to leave the European Union. Data Friday showed the housing market had its worst 12 months since 2013 last year, consumers remained reticent about borrowing and a gauge of services, the largest part of the economy, stayed sluggish. The latter report, combined with measures of construction and manufacturing, indicates growth may have slowed to 0.1 per cent in the final quarter of last year, according to IHS Markit. “The economy effectively has ground to a halt, primarily due to mounting concerns about Brexit,” said Samuel Tombs, an economist at Pantheon Macroeconomics. “Recent indicators point to softness in retail spending. What’s more, the official data have begun to mirror the weakness of the PMIs.” He predicts growth slowed to just 0.2 per cent in the fourth quarter. 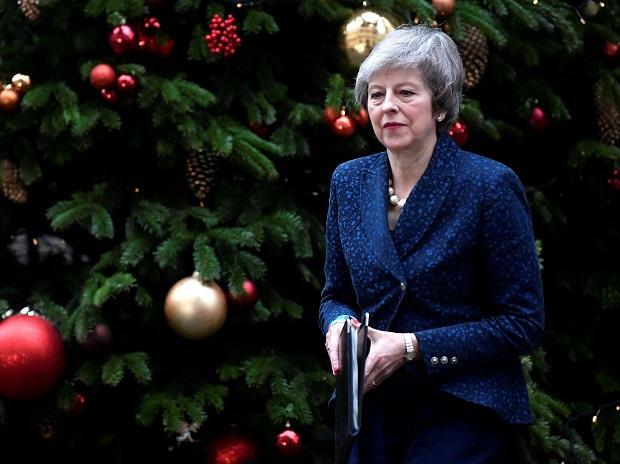 Fears the nation may crash out of the EU without a deal are increasing as Parliament prepares to vote on Prime Minister Theresa May’s widely opposed Brexit deal in less than two weeks. With Britain due to leave the EU on March 29, with or without an agreement, May is running out of time to resolve the divisions in her Conservative Party. The government has stepped up its planning for a no-deal exit, while Markit said this week that manufacturers are aggressively stockpiling as they brace for a potentially disruptive departure. The uncertainty also poses a challenge for officials at the Bank of England, who will publish new forecasts on growth and inflation in February as they announce their decision on interest rates. Markets have priced out any increase in the next 12 months, even as BOE Mark Carney warned that a disorderly exit from the EU may force the bank to raise rates to contain inflation. A disorderly Brexit would put the BOE in crisis-fighting mode -- the pound would fall, fanning inflation, while new trade barriers would put the brakes on growth. House prices grew just 0.5 per cent in 2018, according to a Nationwide Building Society report on Friday. Mortgage approvals dipped to a seven-month low in November and unsecured credit rose at its slowest annual pace for almost four years, BOE data showed the same day. Household confidence fell to the lowest level since 2013 last month, according to a report Thursday from YouGov and the Centre for Economics and Business Research. Retailers have been bracing for weak spending over the key Christmas period. Policy makers have insisted domestic inflationary pressures are building, and that they could stay on a path to normalizing monetary policy even if a deal is signed in time. The services PMI published Friday showed that wages are increasing, pushing up costs for firms. The BOE will still have a tricky trade-off between supporting growth and fighting inflation. Economists in a Bloomberg survey are forecasting growth of just 1.3 per cent overall for 2018, and only a slight recovery to 1.5 per cent this year. Carney may face questions about the potential impact of Britain’s new trading relationship with the EU when he takes part in an online forum about the future of money on Jan. 9. The event comes in the wake of criticism that post-Brexit economic scenarios published by the central bank late last year overstated the risks of a no-deal departure.